I spent a wonderful week touring the star-filled nightscapes of southwest Saskatchewan. On their license plates Saskatchewan is billed as the Land of Living Skies. I like the moniker that Saskatchewan singer-songwriter Connie Kaldor gives it – the sky with nothing to get in the way. Grasslands National Park should be a mecca for all stargazers. It is a Dark Sky Preserve. You can be at sites in the Park and not see a light anywhere, even in the far distance on the horizon, and barely any sky glows from manmade sources. The lead image shows the potential for camping in the Park under an amazing sky, an attraction that is drawing more and more tourists to sites like Grasslands. This is a multi- panel panorama of the Milky Way over the historic 76 Ranch Corral in the Frenchman River Valley, once part of the largest cattle ranch in Canada. Mars shines brightly to the east of the galactic core. Mars and the Milky Way over the tipis at Two Trees area in Grasslands National Park, Saskatchewan on August 6, 2018. Some light cloud added the haze and glows to the planets and stars. Illumination is by starlight. No light painting was employed here. This is a stack of 8 exposures for the ground, mean combined to smooth noise, and a single untracked exposure for the sky, all 30 seconds at f/2.8 with the Sigma 20mm lens, and Nikon D750 at ISO 6400 with LENR on. Mars (at left) and the Milky Way (at right) over a single tipi (with another under construction at back) at the Two Trees site at Grasslands National Park, Saskatchewan, August 6, 2018. I placed a low-level warm LED light inside the tipi for the illumination. This is a stack of 6 exposures, mean combined to smooth noise, for the ground, and one untracked exposure for the sky, all 30 seconds at f/2.2 with the 20mm Sigma lens and Nikon D750 at ISO 3200. The Big Dipper and Arcturus (at left) over a single tipi at the Two Trees site at Grasslands National Park, Saskatchewan, August 6, 2018. This is a stack of 10 exposures, mean combined to smooth noise, for the ground, and one untracked exposure for the sky, all 30 seconds at f/2.8 with the 20mm Sigma lens and Nikon D750 at ISO 6400. Light cloud passing through added the natural star glows, enlarging the stars and making the pattern stand out. No soft focus filter was employed, and illumination is from starlight. No light painting was employed. Some airglow and aurora colour the sky. A Glow filter from ON1 Photo Raw applied to the sky to further soften the sky. At the Two Trees site visitors can stay in the tipis and enjoy the night sky. No one was there the night I was shooting. The night was warm, windless, and bug-less. It was a perfect summer evening. From Grasslands I headed west to the Cypress Hills along scenic backroads. The main Meadows Campground in Cypress Hills Interprovincial Park, another Dark Sky Preserve, is home every year to the Saskatchewan Summer Star Party. About 350 stargazers and lovers of the night gather to revel in starlight. The Perseid meteor shower over the Saskatchewan Summer Star Party, on August 10, 2018, with an aurora as a bonus. The view is looking north with Polaris at top centre, and the Big Dipper at lower left. The radiant point in Perseus is at upper right. The sky also has bands of green airglow, which was more prominent in images taken earlier before the short-lived aurora kicked up. The aurora was not obvious to the naked eye. However, the northern sky was bright all night with the airglow and faint aurora. This is a composite of 10 images, one for the base sky with the aurora and two faint Perseids, and 9 other images, each with Perseids taken over a 3.3 hour period, being the best 9 frames with meteors out of 360. Each exposure was 30 seconds at f/2 with the 15mm Laoawa lens and Sony a7III at ISO 4000. I rotated all the additional meteor image frames around Polaris to align the frames to the base sky image, so that the added meteors appear in the sky in the correct place with respect to the background stars, retaining the proper perspective of the radiant point. A Perseid meteor streaks down the Milky Way over the Saskatchewan Summer Star Party in the Cypress Hills of southwest Saskatchewan, at Cypress Hills Interprovincial Park, a Dark Sky Preserve. The Milky Way shines to the south. About 350 stargazers attend the SSSP every year. Observers enjoy their views of the sky at left while an astrophotographer attends to his camera control computer at right. This is a single exposure, 25 seconds, with the Laowa 15mm lens at f/2 and Sony a7III camera at ISO 3200. 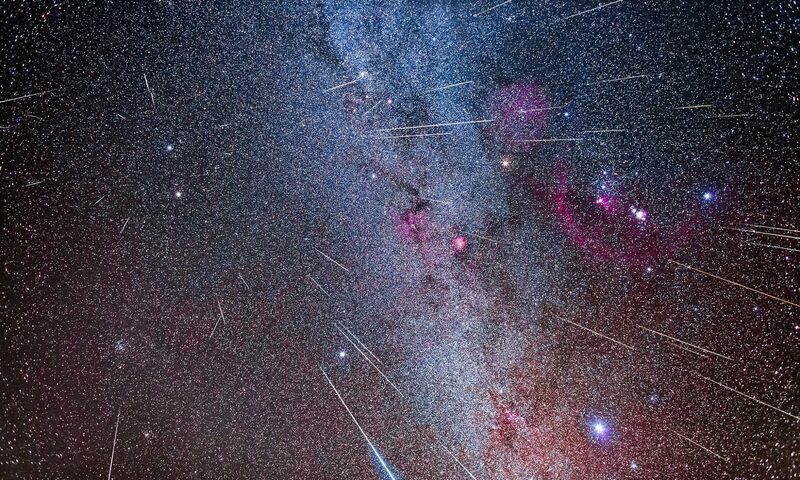 This year coincided with the annual Perseid meteor shower and we saw lots! Most nights were clear, and warmer than usual, allowing shirt-sleeve observing. It was a little bit of Arizona in Canada. Everyone enjoyed the experience. I know I did! SSSP and Cypress Hills are stargazing heaven in Canada. From Cypress Hills I drove due north to finally, after years of thinking about it, visit the Great Sandhills near Leader, Saskatchewan. Above is a panorama from the “Boot Hill” ridge at the main viewing area. The Sandhills is not a provincial park but is a protected eco zone, though used by local ranchers for grazing. However, much of the land remains uniquely prairie but with exposed sand dunes among the rolling hills. There are farm lights in the distance but the sky above is dark and, in the panorama above, colored by twilight and bands of red and green airglow visible to the camera. It’s dark! In the twilight, from the top of one of the accessible sand dunes, I shot a panorama of the array of four planets currently across the sky, from Venus in the southwest to Mars in the southeast. This is the kind of celestial scene you can see only where the sky has nothing to get in the way. If you are looking for a stellar experience under their “living skies,” I recommend Saskatchewan. Nothing amazes even the most inveterate skywatcher more than traveling to another hemisphere and seeing sky move. It moves the wrong way! Whether you are from the southern hemisphere traveling north, or as I do, travel south from the Northern Hemisphere, watching how the sky moves can be disorienting. Here I present a video montage of time-lapses shot last April in Australia, at the annual OzSky Star Party near Coonabarabran in New South Wales. Select HD and Enlarge button to view at full screen at best quality. You’ll see the sky set in the west but traveling in arcs from right to left, then in the next clip, rise in the east, again moving from right to left. That’s the wrong angle for us northerners. Looking north you see the seasonal constellations, the ones that rise and set over a night and that change with the seasons. In this case, the night starts with Orion (upside-down!) to the north but setting over in the west, followed by Leo and bright Jupiter. The sky is moving from east to west, but that’s from right to left here. The austral Sun does the same thing by day. Looking south, we see the circumpolar constellations, the ones that circle the South Celestial Pole. Only there’s no bright “South Star” to mark the pole. The sky, including the two Magellanic Clouds (satellite galaxies to the Milky Way) and the spectacular Milky Way itself, turns around the blank pole, moving clockwise – the opposite direction to what we see up north. I shot the sequences over four nights in early April, as several dozen stargazers from around the world revelled under the southern stars, using an array of impressive telescopes supplied by the Three Rivers Foundation, Australia, for us to explore the southern sky. I’ll be back next year! Last week, northerners marvelled at the splendours of the southern hemisphere sky from a dark site in Australia. I’ve attended the OzSky Sky Safari several times and have always come away with memories of fantastic views of deep-sky wonders visible only from the southern hemisphere. This year was no exception, as skies stayed mostly clear for the seven nights of the annual star party near Coonabarabran, New South Wales. About 35 people from the U.S., Canada and the U.K. attended, to take in views through large telescopes supplied by the Australian branch of the Texas-based Three Rivers Foundation. The telescopes come with the best accessory of all: knowledgeable Aussies who know the southern sky and are delighted to present its splendours to us visiting sky tourists. Here are a few of the night scenes from last week. The lead image above shows a 360° panorama of the observing field and sky from early in the evening, as Orion sets in the west to the right, while Scorpius rises in the east to the left. The Large Magellanic Cloud is at centre, while the Southern Cross shines to the upper left in the Milky Way. This is a stitch of 8 panels, each with the 14mm Rokinon lens at f/2.8 and mounted vertical in portrait orientation. Each exposure was 2.5 minutes at ISO 3200 with the Canon 5D MkII, with the camera tracking the sky on the iOptron Sky Tracker. Stitched with PTGui software with spherical projection. This panorama, presented here looking south in a fish-eye scene, is from later in the night as the galactic core rises in the east. Bright Jupiter and the faint glow of the Gegenschein are visible at top to the north. Each night observers used the big telescopes to gaze at familiar sights seen better than ever under Australian skies, and new objects never seen before. This is a stack of 4 x 5 minute exposures with the Rokinon 14mm lens at f/2.8 and Canon 5D MkII at ISO 1600, all tracked on the iOptron Sky Tracker, plus one 5-minute exposure untracked of the ground to prevent it from blurring. The trees are blurred at the boundary of the two images, tracked and untracked. The Dark Emu of aboriginal sky lore rises above some of the 3RF telescopes. This is a single untracked 13-second exposure with the 35mm lens at f/2 and Canon 6D at ISO 6400. Carole Benoit from Calgary looks at the Orion Nebula as an upside-down Orion sets into the west. This is a single untracked 10-second exposure with the 35mm lens at f/2 and Canon 6D at ISO 6400. John Bambury hunts down an open cluster in the rich southern Milky Way near Carina and Crux. This is a single 13-second untracked exposure with the 35mm lens at f/2 and Canon 6D at ISO 6400. David Batagol peers at a faint galaxy below the Large Magellanic Cloud, a satellite galaxy to our Milky Way. Check here for details on the OzSky Star Safari. What a wonderful night for stargazing under the Milky Way and amid the rock formations of southern New Mexico. This was the scene last night, November 22, at a monthly stargazing session hosted by the City of Rocks State Park and the local Silver City Astronomy Club. You couldn’t ask for a better night … and site. The Milky Way swept overhead, from Sagittarius setting in the west at left, to Taurus rising in the east at right. The faint glow of Zodiacal Light sweeps up from the last glow of western twilight to the left. Some faint green bands of airglow that only the camera can capture are also visible near the horizon. Matt is doing a laser tour, following which the group convened to the beautiful roll-off roof observatory that houses a Meade 14-inch telescope. It was a fine evening indeed. The panorama, which spans about 300° (I cropped the edges a little from the full 360°) consists of 8 segments, shot at 45° spacings, with a 15mm full-frame fish-eye lens at f/2.8, for 1 minute untracked exposures for each frame at ISO 800 with the Canon 6D. I stitched the segments in PTGui software, but processed them in Adobe Camera Raw and Photoshop. This weekend Jasper National Park in Alberta, Canada celebrates the night sky at its annual Dark Sky Festival. Last night was wonderful. Skies cleared at Lake Annette for a star party with 1000 people in attendance. 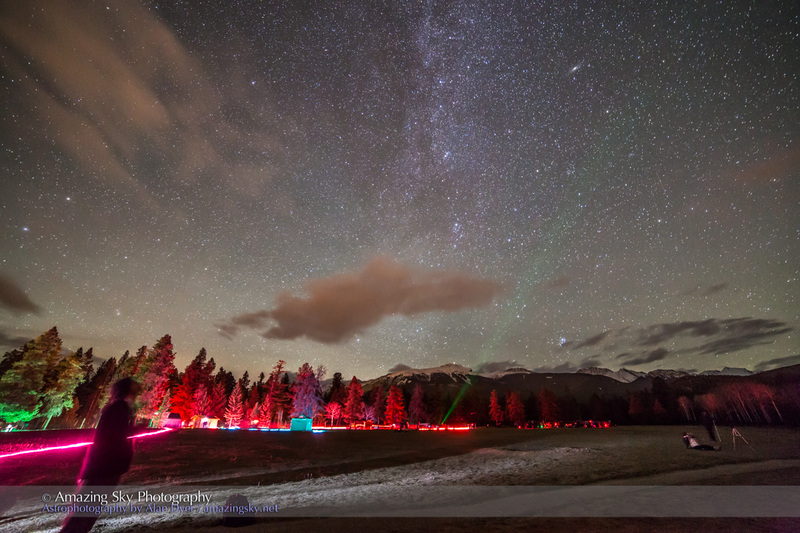 The event was a core program of a week-long Festival celebrating Jasper National Park’s status as a Dark Sky Preserve. 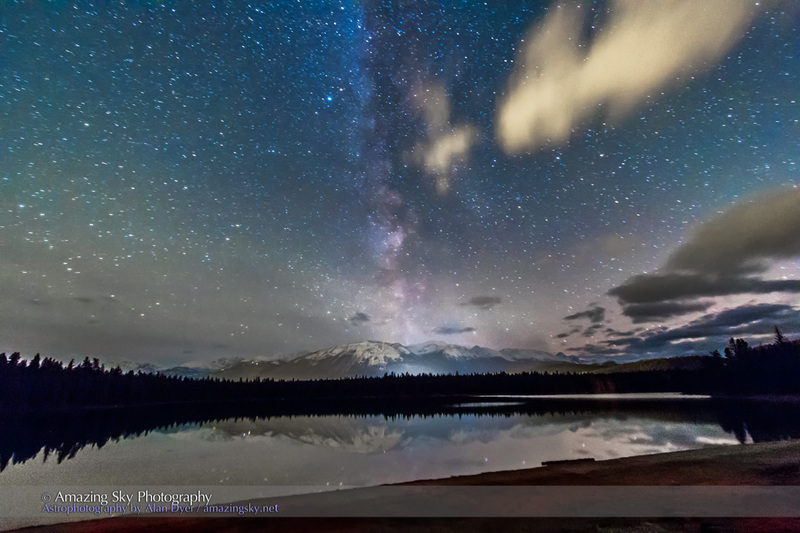 The top photo shows what we’re celebrating – the stars and Milky Way reflected in the still waters of Lake Annette. What you don’t see in that image are the hundreds of people behind me enjoying the star party. I’m one of the featured guest speakers, though last night my role at the star party was to assist at informal tutorials to help people take their own night sky images. And lots of people showed up with cameras and tripods and got great shots. While I was not able to make the rounds of all the activities, elsewhere at Lake Annette (just follow the coloured rope lights!) there were talks, First Nations performances and storytelling, laser tours of the sky, activities for kids, and lots of telescopes to look through. Everyone got to see amazing sights in the sky. Shuttle buses from town came and went through the night, to avoid a parking lot jam. The Festival is a huge hit, with hotels in town filled – there isn’t a room available. The event went very well, at what was perhaps Canada’s largest public star party ever held under dark skies. The Milky Way towers over the pine trees and sagebrush of Mt. Kobau in the South Okanagan, BC. It’s been a fine two nights renewing friendships and seeing stars at the summit of Mount Kobau near Osoyoos. I’ve not been here for a dozen years but the timing worked out this year for me to visit the annual Mt. Kobau Star Party, the first star party I attended back in the 1980s. It’s a rough road to the summit but the reward is a beautiful landscape and skyscape. The main image above is from Monday night and takes in the Milky Way from horizon to zenith, from Sagittarius to Cygnus. I used a 15mm lens and Canon 5D MkII riding on a new Sky-Watcher Star Adventurer tracking unit, which worked beautifully. 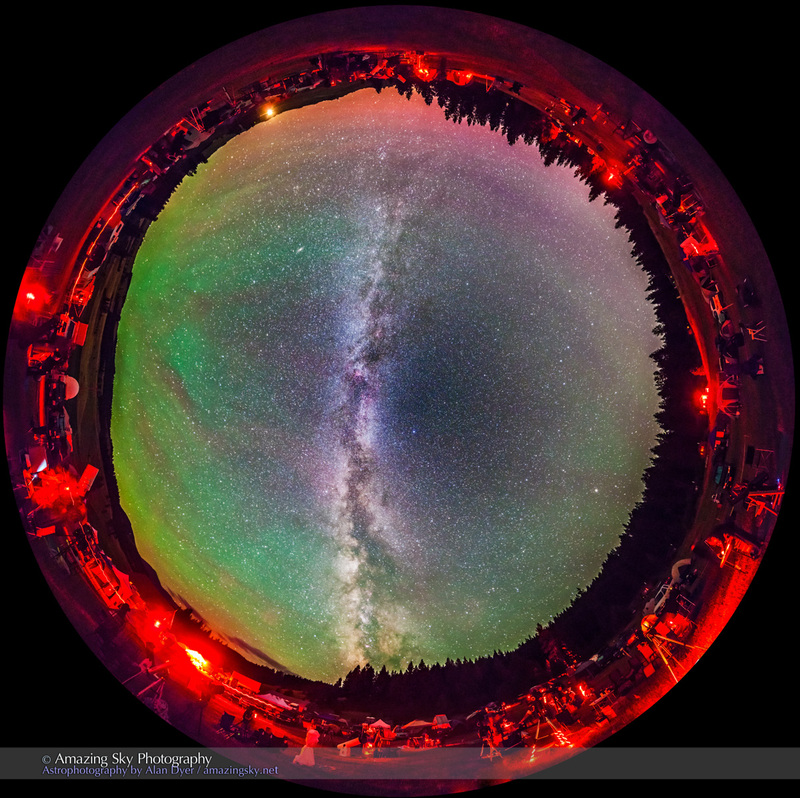 This image, similar to one I took a few nights ago at the Table Mountain Star Party, is a 360° panorama of the land and sky at the Kobau summit. It is a stitch of 8 segments, each 45-second exposures at ISO 6400 with the Canon 6D and 14mm Rokinon lens. Unfortunately, it shows the light pollution glows from Osoyoos and Oliver that have grown over the last 3 decades and now impinge upon the Kobau skies. 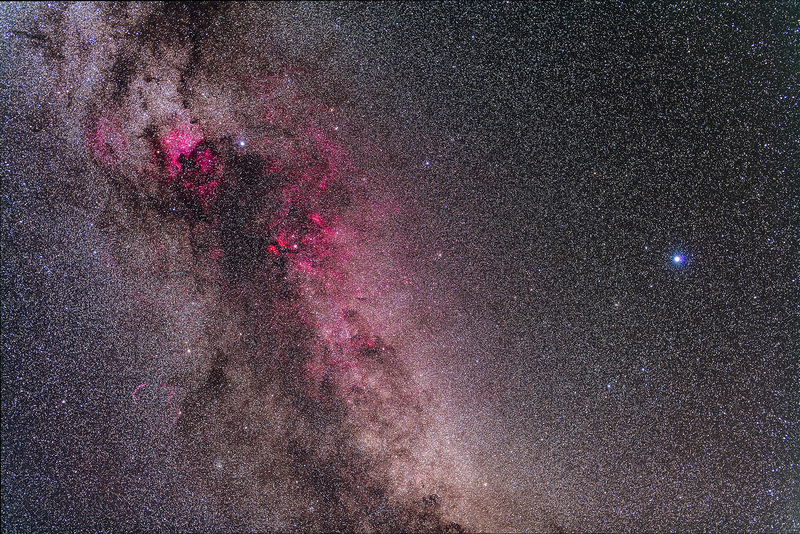 This image is a tracked closeup of the Cygnus and Lyra area of the Milky Way, taken with a 50mm lens and the 5D Mark II riding on the Star Adventurer for a stack of five 10-minute exposures. It is rich in the red nebulosity of the Cygnus spiral arm and takes in the field that the Kepler satellite stared at for 4 years looking for alien planets. I’m heading home but the star party continues all week, building to the weekend when most people will be attending, under prospects of clear skies and warm weather. 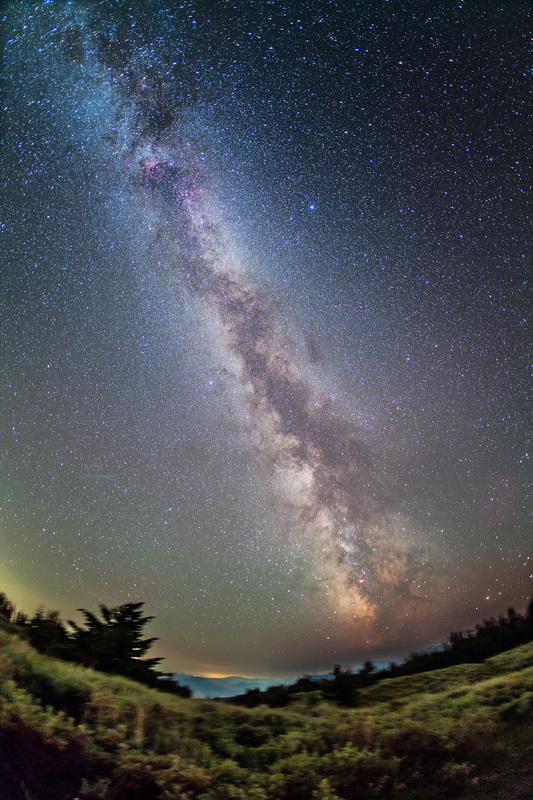 The Milky Way spans the sky on a summer night at a dark-sky star party. What a fabulous weekend! For the last few nights I’ve enjoyed the skies and hospitality of the Table Mountain Star Party in northern Washington state, near Oroville, just south of the Canada-US border. The site is the Eden Valley Guest Ranch, under superbly dark skies. About 300 people, mostly from Washington, enjoyed getting under the Milky Way. I was impressed with the great mix of ages and demographics at the TMSP – it wasn’t just “old timers.” There were young families, couples, teens, even a pair of grannies pulled in for a look at the starry sky! But the other main feature is the green fingers of airglow rising out of the east (at left in the circular image above). Only the camera picked these up – the sky looked very dark to the eye. There’s even a faint magenta glow on the northern horizon (at top in the circular image) from aurora. Both images capture the entire sky, in a panorama set I took using a 14mm Rokinon lens, shooting vertically for 8 segments at 45° spacings. Each frame was a 45-second exposure at f/2.8 and ISO 6400, on a standard tripod, no tracking. I used PTGui software to stitch and blend the images, then Photoshop CC 2014 to finish them off. The top image uses “equirectangular” projection; the bottom image “stereographic” projection for a fish-eye effect. Both take in the entire sky from horizon to horizon, plus a lot of ground, filled with red-lighted and happy observers.